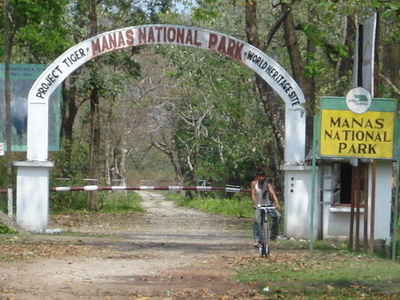 Manas National Park or Manas Wildlife Sanctuary is a Wildlife Sanctuary, UNESCO Natural World Heritage site, a Project Tiger Reserve, an Elephant Reserve and a Biosphere Reserve in Assam, India. Located in the Himalayan foothills, it is contiguous with the Royal Manas National Park in Bhutan. The park is known for its rare and endangered endemic wildlife such as the Assam Roofed Turtle, Hispid Hare, Golden Langur and Pygmy Hog.Manas is famous for its population of the Wild water buffalo. It is such a beautiful site to behold and see consisting from river to animal , flora to aparatis and earth. Political Geography: The park area falls in five districts: Kokrajhar, Chirang, Baksa, Udalguri, and Darrang in the state of Assam in India. The park is divided into three ranges. The western range is based at Panbari, the central at Bansbari near Barpeta Road, and the eastern at Bhuiyapara near Pathsala. The ranges are not well connected; while two major rivers need to be forded in going from the centre to the Panbari, there is a rough trail (the daimAri road) connecting the central to the eastern range. Most visitors come to Bansbari and then spend some time inside the forest at Mathanguri on the Manas River at the Bhutan border. Manas is located in the Eastern Himalaya foothills. The park is densely forested. The Manas river is the main river, a major tributary of Brahmaputra river. The Manas River flows through the west of the park, further it splits into two separate rivers, the Beki and Bholkaduba. Manas and five other small rivers flow through the National Park which lies on a wide low-lying alluvial terrace below the foothills of the outer Himalaya. 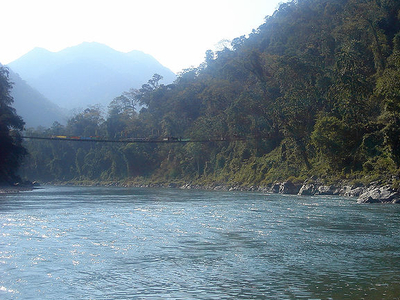 The river also acts an international border dividing India and Bhutan. The bedrock of the savanna area in the north of the park is made up of Limestone and sandstone, whereas the grasslands in the south of the park is made up of deep deposits of fine alluvium. The combination of Sub-Himalayan Bhabar Terai formation along with riverine succession continuing up to Sub-Himalayan mountain forest making it one of the richest biodiversity areas in the world. The park is 950 km². in area and situated at a height of 61m to 110m above mean sea level. The Burma Monsoon Forests of Manas lie on the borders between the Indo-Gangetic and Indo-Malayan biogeographical realms and is part of the Brahmaputra Valley Biogeographic Province. The combination of Sub-Himalayan Bhabar Terai formation with riverine succession leading up to Sub-Himalayan mountain forest makes it one of the richest biodiversity areas in the world. The main vegetation types are Sub-Himalayan Light Alluvial Semi-Evergreen forests in the northern parts, East Himalayan mixed Moist and Dry Deciduous forests (the most common type), Low Alluvial Savanna Woodland, and Assam Valley Semi-Evergreen Alluvial Grasslands which cover almost 50% of the Park. The sanctuary has recorded 55 species of mammals, 380 species of birds, 50 of reptiles, and 3 species of amphibians. Out of these wildlife, 21 mammals are India’s Schedule I mammals and 31 of them are threatened. The fauna of the sanctuary include Asian Elephants, Indian Rhinoceros, Gaurs, Asian Water Buffaloes, Barasingha, Indian Tigers, Leopards, Clouded Leopards, Asian golden cat, Capped Langurs, Golden Langurs, Assamese Macaques, Slow Loris, Hoolock Gibbons, Smooth-coated Otters, Sloth Bears, Barking Deer, Hog Deer, Black Panther, Sambar Deer and Chital. The park is well known for its rare and endangered wildlife which is not found anywhere else in the world like the Assam Roofed Turtle, Hispid Hare, Golden Langur and Pygmy Hog. Manas houses more than 450 species of birds.Manas have the largest population of endangered Bengal Florican. The major other birds includes Giant Hornbills, Jungle Fowls, Bulbuls, Brahminy Ducks, Kalij Pheasants, Egrets, Pelicans, Fishing Eagles, Serpent Eagles, Falcons, Scarlet Minivets, Bee-Eaters, Magpie Robins, Pied Hornbills, Grey Hornbills, Mergansers, Harriers, Ospreys and Herons. Elephant Rides, Jeep Jungle Safari, Manas Nature Trails And Treks, River Rafting, Bird Watching. The rassland biomes : pygmy hog, Indian rhinoceros (re-introduced in 2007 after extinction due to heavy poaching during the Bodo uprising), bengal florican, wild Asian buffalo, etc. The forest biomes : slow loris, capped langur, wild pig, sambar, great hornbill, Malayan giant squirrel or black giant squirrel, etc. There are four kinds of transportation available according to Main Uddin says in a article. Here's the our members favorite photos of "National Parks in Assam". 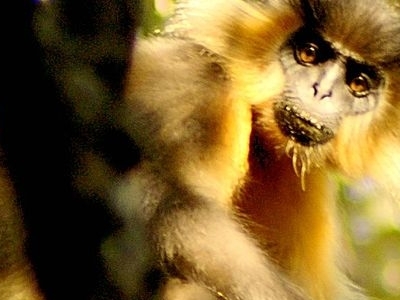 Upload your photo of Manas National Park!